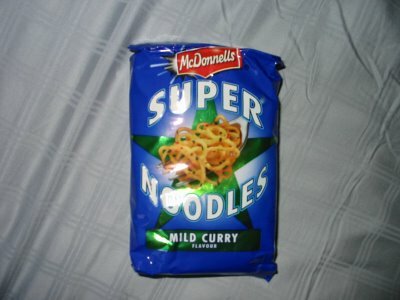 This flavour of Super Noodles is a new addition to the line, evidenced by the "New in the family" label on the wrapper. The packaging of these noodles is especially festive, celebrating the culture and food of Italy. Spag Bol stands for Spaghetti Bolognese, which Americans usually crudely refer to as Spaghetti w/ Meat Sauce. This time, the Top Tip had nothing to do with pitta breads. It was "Top with meatballs or sliced pepperoni". I suppose this makes a lot of sense since it is Spag Bol flavour! A little bit unfortunate, since I actually had pitas which I could have used. Although I'm not fully sold on the thought of putting instant noodles inside a pita. I was impressed that upon adding the flavour sachet, the concoction actually smelled distinctly like Spag Bol. I accidentally drained a little bit too much water from the noodles, so they ended up being sticky and a little hard to mix. So make sure to leave some water in there! 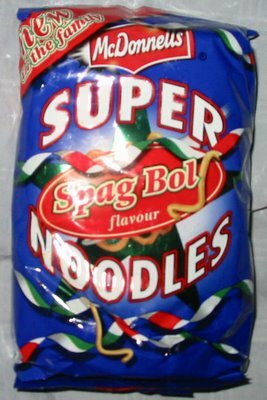 The flavour of these noodles was quite good, although I must admit that they smelled a little more like Spag Bol than they tasted. Bonus points for crushed red pepper, onion flakes, and garlic flakes in the flavour packet. I think these are the first noodles I've ever had that had garlic flakes in them, and they were certainly a great addition. Is it ramen if it doesn't come in soup? And if it's labeled on the front as kosher? This 80 gram "ramen" hails from Indonesia and comes with an amazing four seasoning sachets. 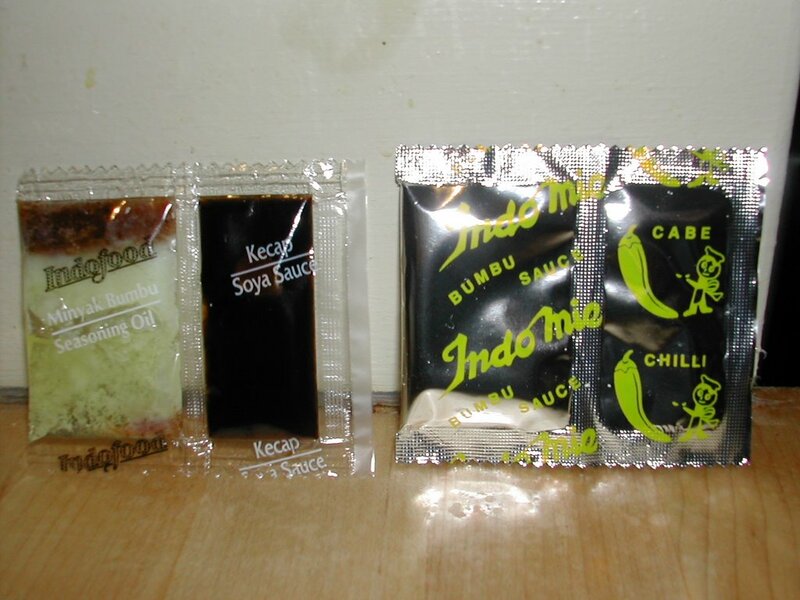 According to the back of the package, these sachets contain soy sauce, seasoning oil, seasoning powder, and chili powder. Eating this ramen was an interesting experience because I have no idea what flavor it was supposed to be. It turns out to be sweet, salty, and spicy. The oil plus the fried noodles make the overall texture quite slippery, and I can't help but feel that it is quite fattening, but maybe that's why it's only 80 grams. 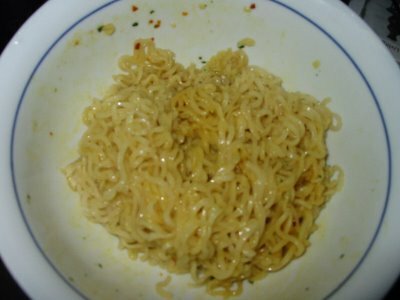 Overall it's an interesting flavor and soft tasty noodle, but I prefer the regular ramen soups. 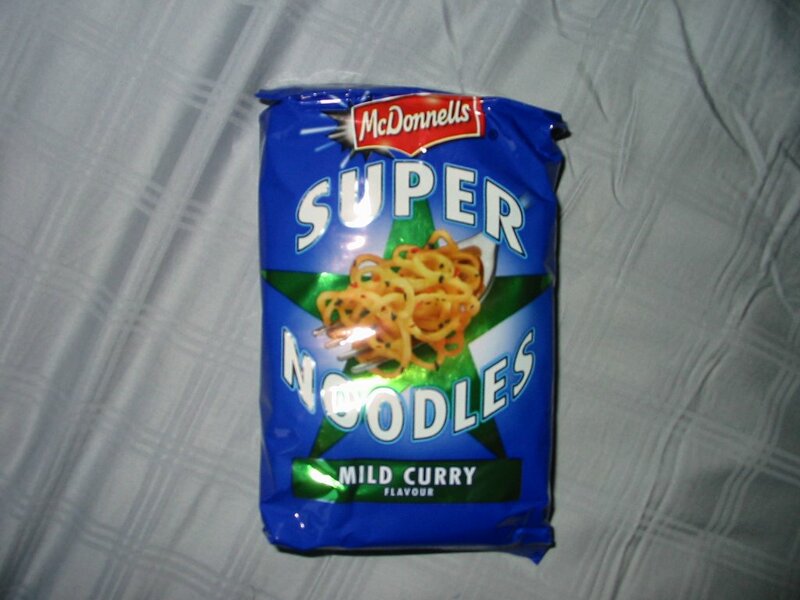 More Super Noodles! I previously blogged about the Barbecue Beef Flavour, while this is the Mild Curry Flavour. 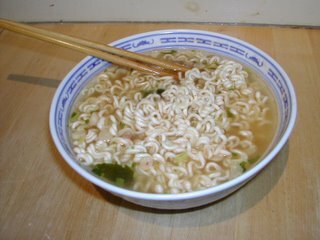 The suggested cooking method is the same: cook the noodles in boiling water until soft, and then drain the water and add the flavor sachet. This time, the mini-recipe on the flavor sachet was: "Smother hot pitta breads with spicy noodles and top with chicken and peppers". I'm not really sure what "spicy noodles" refers to, since these noodles are certainly not spicy. But it seems like the makers of Super Noodles have a strange obsession with "pitta breads". We'll see if the other Super Noodles Top Tips suggest using "pitta breads" as well. When I put in the flavor sachet, I was a little shocked to see some neon yellow powder coming out. I guess it was a little surprising because the flavor packets in Asian ramen are almost always filled with brown, black, or dark red powder. But I suppose it makes sense, since this is curry flavor after all. The flavor of the mild curry was surprisingly tangy and delicious. There were small flakes of scallions and red pepper that added no flavor but did contribute some color to the dish. Like the Barbecue Beef Flavour, these noodles are relatively basic, but the Mild Curry Flavour is very well designed and extremely flavorful and pleasant. Paldo Korean Noodle is a 120 gram ramen suitable for the hungry ramen lover. 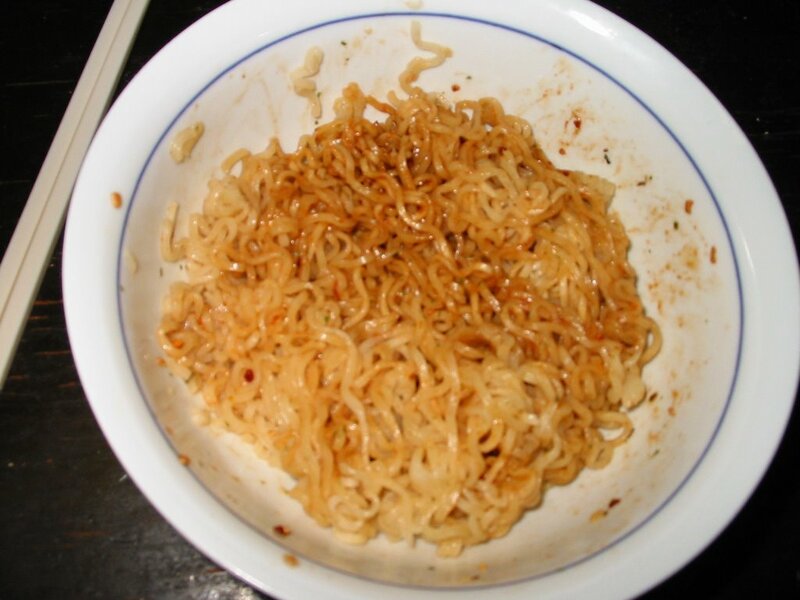 I was hoping that, like Shin Ramyun, the noodles would come in a round shape perfect for microwaving in my bowl. But alas, it was the standard slightly rectangular shape. 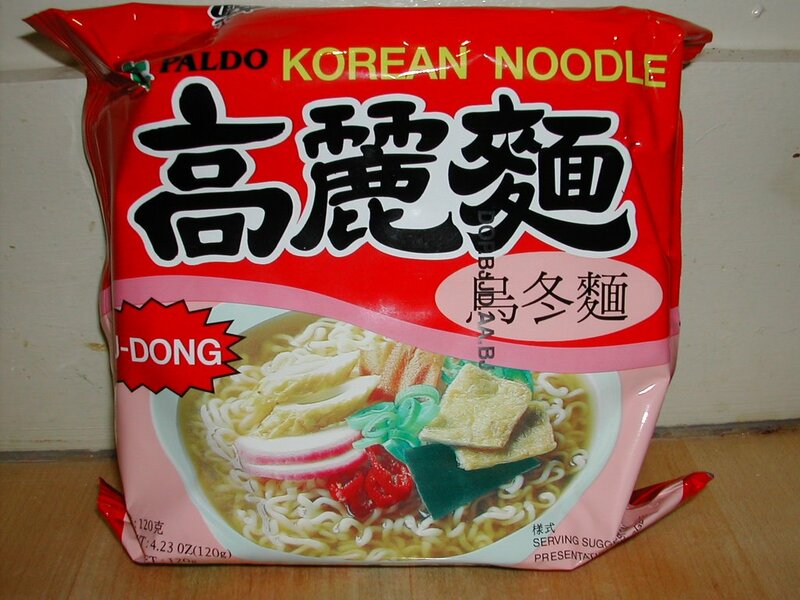 The U-Dong flavor comes with two packets. One is a veggie packet that continues a variety of dried veggies, including nori (seaweed), carrot, scallion, and onion flakes. The other is a deceptively red-orange powder that forms the soup base. It looks like it would be incredibly spicy, but in fact it is not spicy at all. 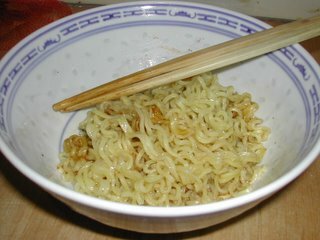 The noodles need to soak for longer than usual, but result in a chewy texture and flavorful taste. 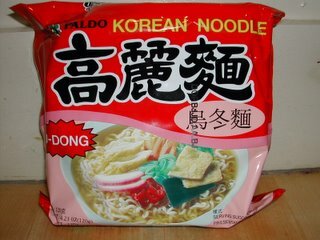 I was pleasantly surprised that the U-Dong flavor is pretty realistic to fresh udon soup. I could definitely recognize and identify the flavor. The noodles, of course, are nothing like udon noodles, but are still pretty high-quality for instant ramen. Although the picture doesn't show it, there are actually a significant number of veggies and I was particularly impressed at how the nori flakes completely rehydrated and expanded. 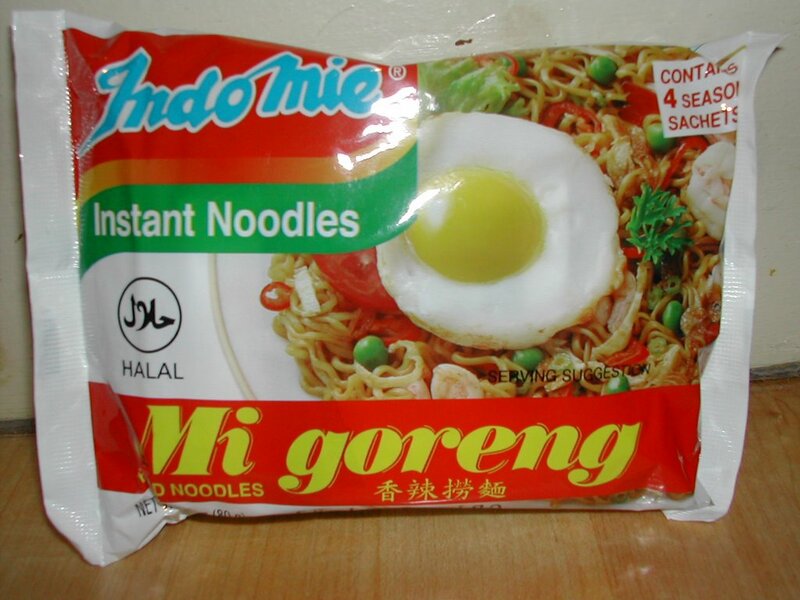 This is an excellent ramen that actually tastes like the flavor it's supposed to be!